Cholesterol is one of the most important substances in the body. It makes up a large part of our cell membranes, brains, and most hormones including vitamin D. Indeed, one of the major functions of cholesterol is to function as an integral part of our immune systems. There is only one kind of cholesterol in the body, the terms HDL and LDL are the names of the particles that carry the cholesterol through the blood. Our bodies make most of the cholesterol we find in our blood. We recycle it through the liver and bile. In short, we can't live without it. It started in the early 1900's. A Russian scientist fed cholesterol to rabbits and induced what looked like heart disease. The problem with this model is that rabbits are vegans and don't have a way to process dietary cholesterol which is NEVER in their diets.This was a time when heart disease was first noted in humans. The Journal of the AMA first described a heart attack in 1912. The first heart attack documented in an American hospital was in 1921. In the 1950's the diet-heart hypothesis was put forth by Ancel Keys bases on cooked numbers. He influenced the AHA and the American government to such an extent that this model stuck. When you get your cholesterol measured, they are looking mostly at your total cholesterol and your LDL. They want your total to be less than 200, and your LDL to be less than 130. They also want your HDL to be above 40, and your triglycerides to be less that 150. The total cholesterol number speaks for itself. The HDL and LDL numbers need a little clarification. They represent the total amount of cholesterol contained in specialized carrier particles formally called LOW DENSITY LIPOPROTEINS (LDL) AND HIGH DENSITY LIPOPROTEINS (HDL). These terms are used to identify the carriers, not the cholesterol, which there is only one kind! As you can see there can't be a bad or good cholesterol, as there is only one kind. Triglycerides represent the amount of fat in your blood, which incidentally are carried in special carriers called VLDLs (very low density lipoproteins). Cholesterol lowering drugs are called statins. They reduce total cholesterol and LDL levels, but have no effect on HDL and Triglycerides. Now does it make sense why these numbers are the ones they focus on, even though the statistics born out by the scientific literature show they are just about meaningless? Statin drugs prevent your body from producing cholesterol, which represents 80% of the cholesterol present. Our hormones are made out of it, vitamin D is made out of it, our brain contains 25% of all the cholesterol in our bodies, even though it is only 2% by weight. Lastly, statins prevent us from making Coenzyme Q10 which is needed to produce the fuel to power our heart and other muscles. The scientific literature shows that statins have no effect on prolonging life in women, men who have not had a cardiac event, or men over 65! The clinical trial on the popular drug Lipitor showed that it prevented one more heart attack per 100 people taking it versus people on a placebo. The actual numbers were 3 heart attacks per 100 on the placebo and 2 taking lipitor. They threw out the people who did not have heart attacks. this left 3 people in the placebo group versus 2 people in the lipitor group. They then claim a 33% reduction in heart attacks!!!! This is called relative risk and is VERY MISLEADING. HDL this generally represents the cholesterol that is taken from the body and transported back to the liver for reprocessing and repackaging to LDL. Think of them as cleaners. When we have an infection or injury, the cholesterol is damaged and needs to be removed to the liver for repair. It will then be put into LDL particles and sent back out to be delivered to where it is needed in the body. LDL particle size: We already know what LDL is. The size of the particle determines whether the Particle can penetrate the artery wall and cause plaque buildup. If you have large particles (calledpattern A) they can't fit between the cells lining the artery. Smaller more dense LDL particles (called pattern B) can and do. C Reactive Protein This is a protein that shows the level of infection, inflammation, and general damage that is in the body. It is non-specific, which means it can be elevated with a cold, or gum disease etc. Inflammation damaging arteries is the new model of heart disease. In short, damage to the arteries is patched by the body using cholesterol among other things. When the patch is unstable, it can rupture and cause a lack of blood to the heart, causing cardiac death. This is an NMR report I from a patient of mine. They have been on cholesterol lowering drugs since 1982. Since then, they have had a triple bypass, a heart attack, and stents placed recently. All this time their total cholesterol and total LDL numbers have been low to normal, and their doctor has been pleased. Their cardiologist was not familiar with this test by the way. 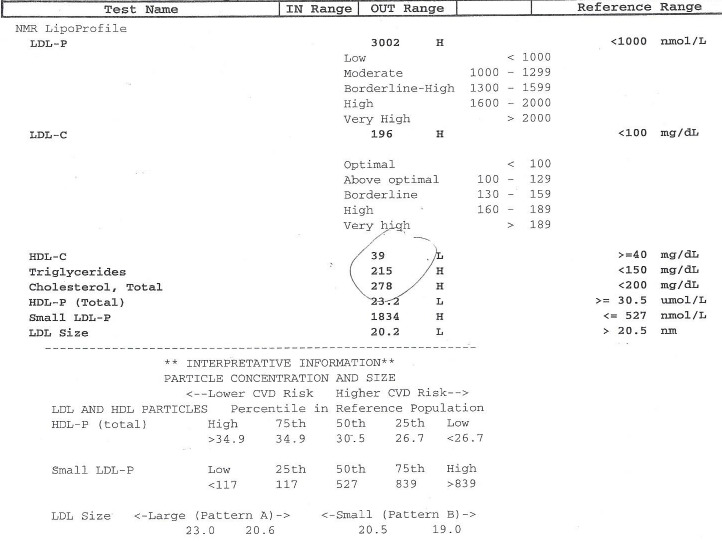 NOTICE HOW THE DOCTOR ONLY CIRCLED THE TOTAL CHOLESTEROL, TRIGLYCERIDES AND HDL TOTALS. After reading this article, it will be clear to you that the other numbers are very indicative someone with a history of coronary artery disease. The patient was off statins for this test, and their total cholesterol went up. They and their doctor are panicking, even though the patient has continued to have cardiac issues despite having supposedly "great numbers" for years. Most of us are too focused on the trees to see the forest! This is a video by Chris Kresser It give great clarity to what I am talking about in this article. When you go to your physician, ask for either an NMR cholesterol test, or a VAP test. Both of these will give you the information you really need to more accurately assess your risk. HDL The best way to raise HDL cholesterol is to eat more fat. That's right, you heard right. Olive oil, egg yolks, butter, coconut oil, nuts, meats, liver etc. Studies clearly show that this will raise HDL. Other very beneficial things include proper sleep, lower stress, walking and low to moderate forms of exercise, and lastly red wine in small doses. LDL Particle Size And Number LDL particles contain triglycerides, other fats and cholesterol. If you are eating a high processed carbohydrate diet, you will have more triglycerides. The more triglycerides you have, the more LDL particles you need to carry them around. Triglycerides are initially carried in VLDL (very low density lipoprotein) particles. VLDL particles have little cholesterol in them. They swap their triglyceride content with other particles for cholesterol and becom IDL particles (intermediate density lipoproteins). They continue this process until they become LDL particles. Due to this process, you end up with more pattern Bparticles that are smaller than the normal pattern A.This process takes time, and the cholesterol and other fats oxidize, which is very bad, especially for the artery lining. Artery damage is why heart disease begins in the first place! When you have larger pattern A particles, they carry more, and therefore you need less of them. Some people with high total LDL numbers have very large particles, and therefore have low risk of heart attacks. Conversely, people with low total LDL numbers, but who have lots of small pattern B LDL particles carrying it around are at higher risk for the particles to embed into the artery lining because thay are small enough to, and they are around for a longer period of time to do so. Think of it this way: if only full buses were allowed on highways, the traffic would be lighter, and the average speed would be higher due to a smaller chance of a traffic jam. This totally explains why there is little value to just measuring total LDL cholesterol (LDLc). Eating a low or no processed carbohydrate diet will result in much lower triglycerides, therefore lower LDLp and the normal pattern A larger particle size. Triglycerides The cholesterol issue is very complex. In explaining LDLp, I implicated triglycerides as the real cause of the mess. Read the above paragraphs again if you want clarification on why it is critical to eat little to no processed carbohydrates. C Reactive Protein If you have high CRP, find out if you have any infections or inflammation! Poor thyroid function, infections and leaky gut syndrome are implicated in higher LDLp. The scope of these subjects is too large for this article. It is a good idea to get your thyroid numbers checked, make sure you don't have gum disease, and visit a Functional Medicine Doctor to check if you have leaky gut. Wheat is a prime cause of leaky gut, so if you are wise, cut it out of your diet by adapting a paleo diet template. Putting it all together As you have seen, statins do nothing to help change the more more important numbers. I would like to introduce the Triglyceride to HDL ratio. You simply take your total triglycerides and divide by your total HDL. 2 and lower is where you want to be. So even if you have an HDL of 40 which is right on the border of being too low, if you lower your triglycerides to 80, you will have a ratio of 2. You can lower your triglycerides by going paleo and ditching the processed carbohydrates. With a ratio of 2 or lower, you can imply that your LDLp and size pattern are normal in case your doctor does not have you take an NMR or VAP test, which is entirely probable-most doctors do not know they exhist! I hope this was helpful! Feel free to leave a question or remark.